Every block that you record fruit samples for should have a sample set created for it and these are configured in the Sample Set Console. Sample Sets act as a grouping mechanism and allow individual samples to be recorded over an extended period of time. The Sample Set Console will be displayed. 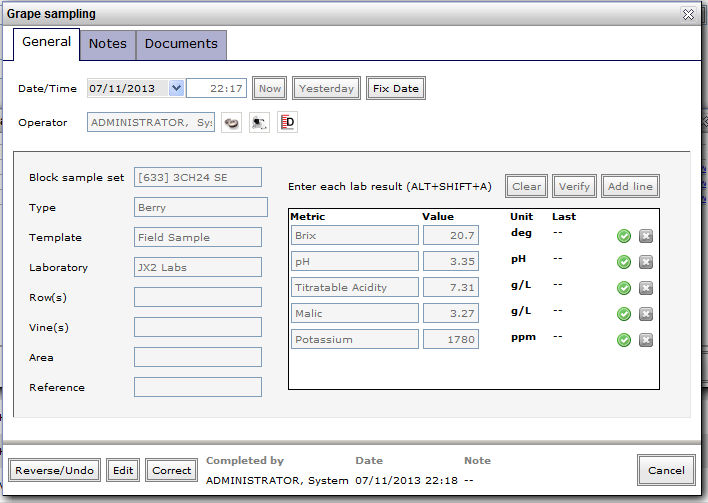 Use the controls at the top of the window to search for existing samples. To create a new sample set against a single block, click the Add sample set button and fill in all the necessary information. This includes the owner of the fruit, the default analysis template as well as the fruit source. The sample set Code can be configured to auto increment or you may specify a code for each sample set that you create. Contact us for assistance in configuring if one is not already setup. 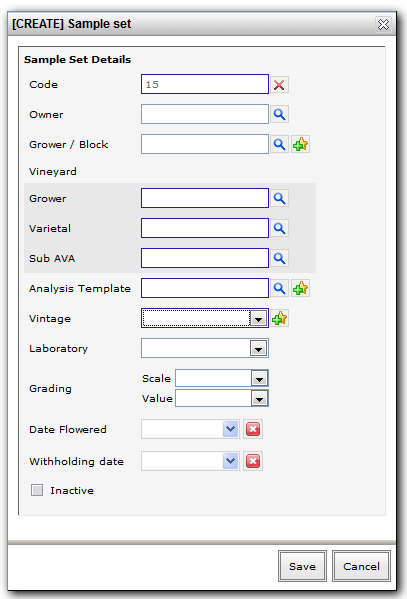 The Grower / Block search fields allows you to quickly search for a grower by any combination of grower, varietal, region or block name. You can only use this field where blocks are configured in the system. Upon selection it will complete the Grower, Varietal and Region fields automatically. We recommend configuring all your sample sets well ahead of vintage in order to save time when it comes to recording the analysis readings. Adding a sample set for each block can be a time consuming process, so to make this easier you can use the Multi Add function. With this option you can add sample sets for a specific Grower or Region by clicking Search. Simply check the blocks you want to record fruit samples for this year and fill out the other properties before clicking Save. A fast way to record the results for a sample set is to click the barcode field from within the vintrace desktop and enter BS<sample code> or if using unique block codes BS<block code>. 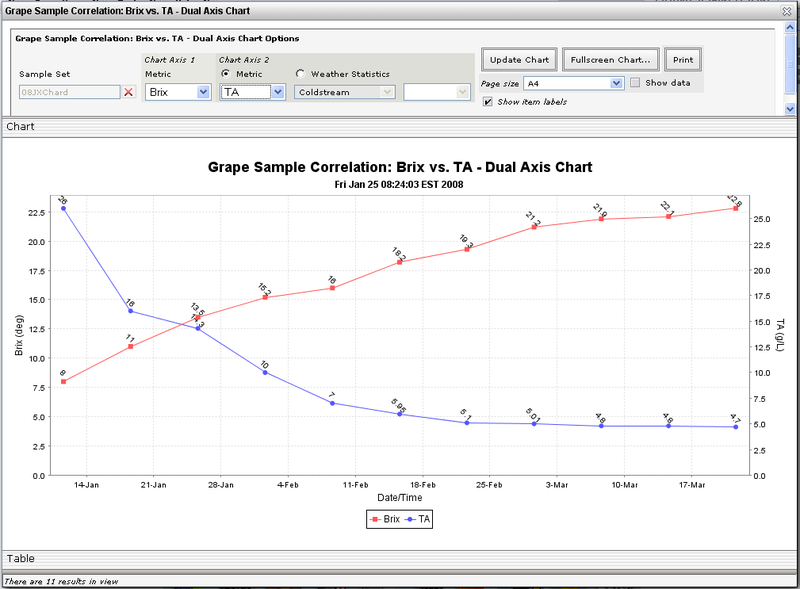 This will take you straight to the Grape sampling window to enter analysis results and is similar to how the lab can enter regular wine analysis from a lab label. A good way to manage the arrival of sample sets and become familiar with the codes is to use the CSV button from the Sample Set Console. This can give you a work-list to use to collect and then process samples. Alternatively, from within the Sample Set Console, find the sample set by using the filter options at the top and clicking search. 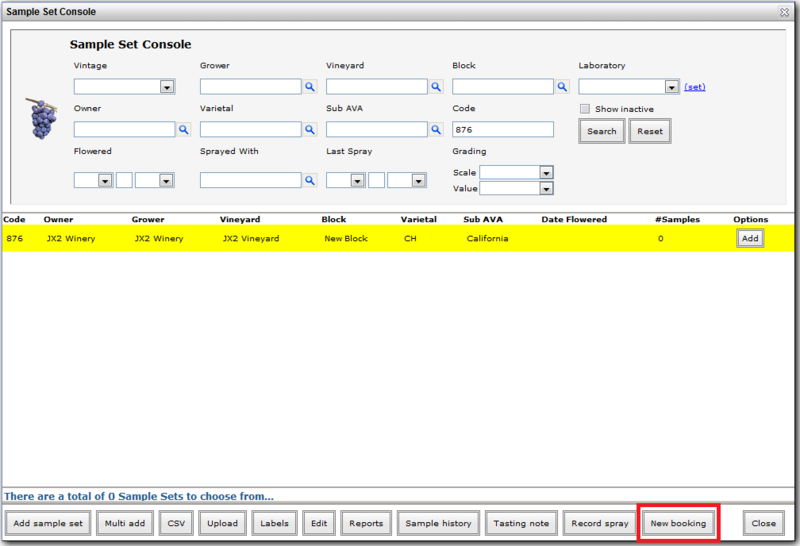 When you locate your sample set click the Add button to record the lab results. 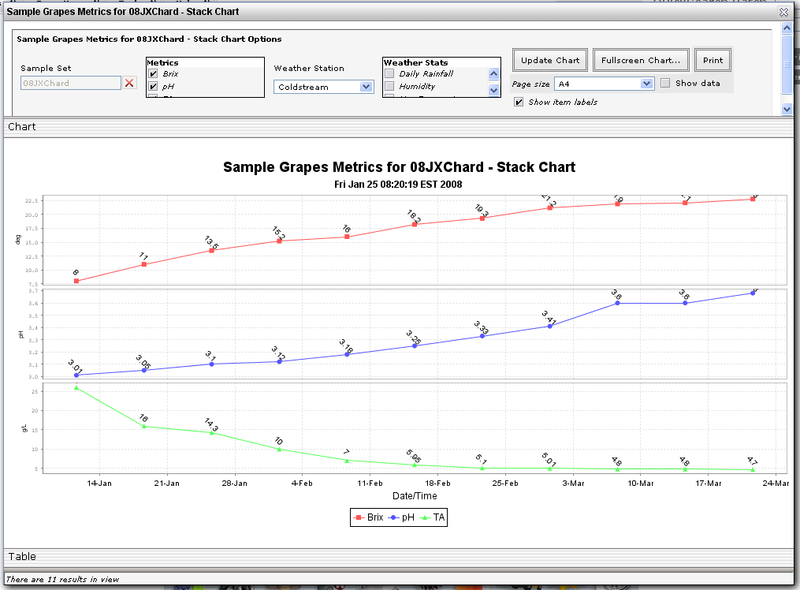 The Grape sampling window will be displayed with the default analysis template and Sample Set pre-selected. Enter the analysis results into the fields on the right-hand side of the screen and click Save to record the data. You may also specify the Type of sample. 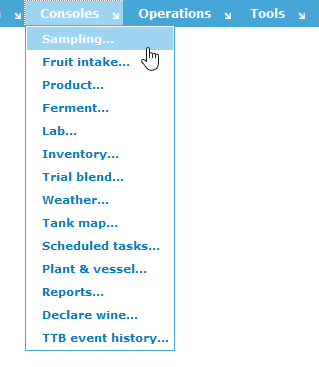 There are several optional fields allowing you to select the type of sample, enter information about the rows or vines and the total sample area. 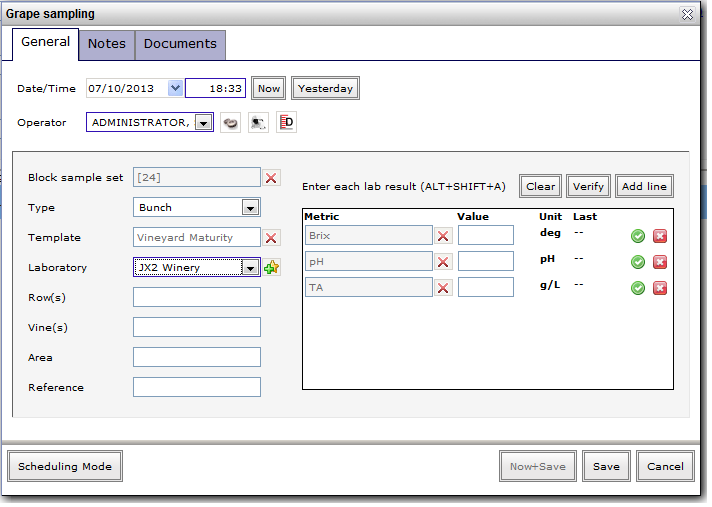 If required, you can create a cellar note (work order) for the grape sampling operation by clicking Scheduling Mode, searching for an existing cellar note or creating a new one and clicking Add to Cellar note. This will take you to the Winery Reports console where you have four options. 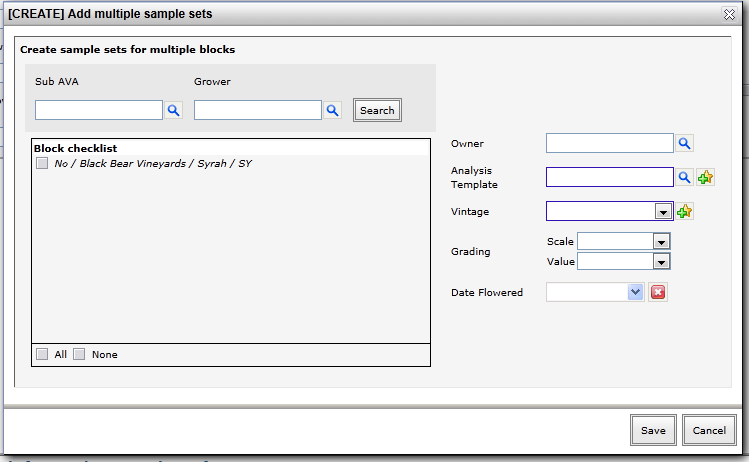 The Sample Day Sheet report produces a PDF or CSV document grouping related samples by Grower, Vineyard and Block for the given date range. It’s useful for comparing sample data across multiple fruit sources within the system for arbitrary periods of time. Click Generate… after setting your desired options. This chart produces a line chart over time with each metric (ph, TA etc) reported on its own separate XY axis in a “stacked” formation. Select each metric you wish to see optionally coupled with weather stats if you have purchased a vintrace Weather Feed. 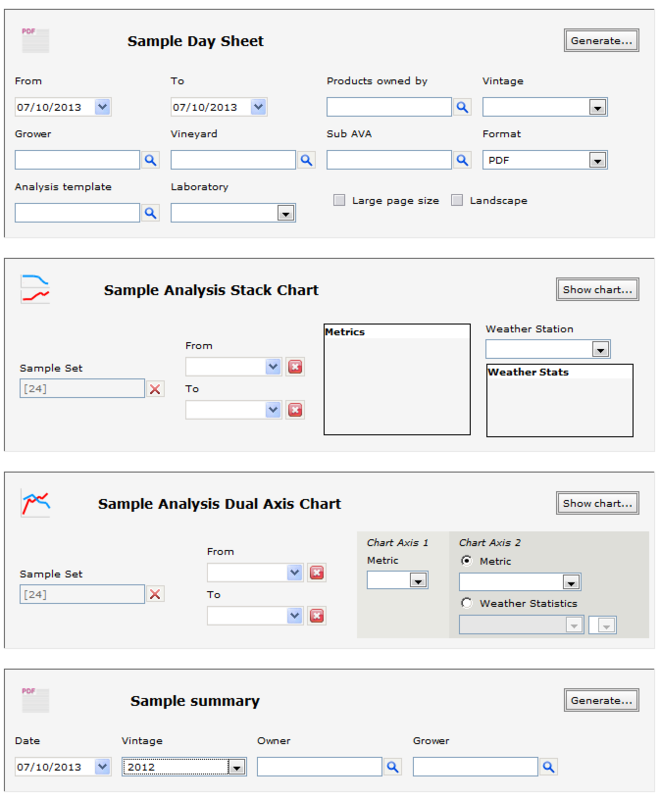 Click Show chart… after setting your desired options. This chart allows you to report on two metrics on the one chart providing for a closer correlation. Select any two metrics to correlate or a metric and a particular weather statistic. Click Show chart… after setting your desired options. 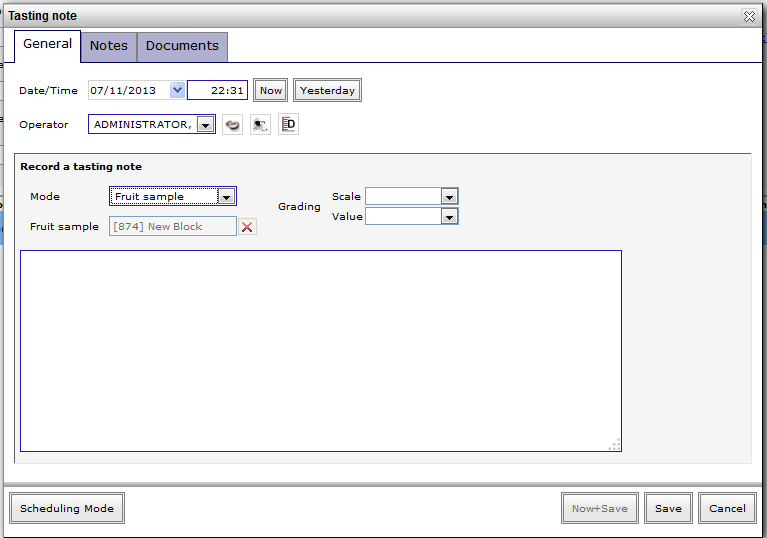 This option will provide you with a CSV file containing all of the analyses undertaken on each block. You can choose to filter this by Vintage, Owner and Grower to get the results you require. 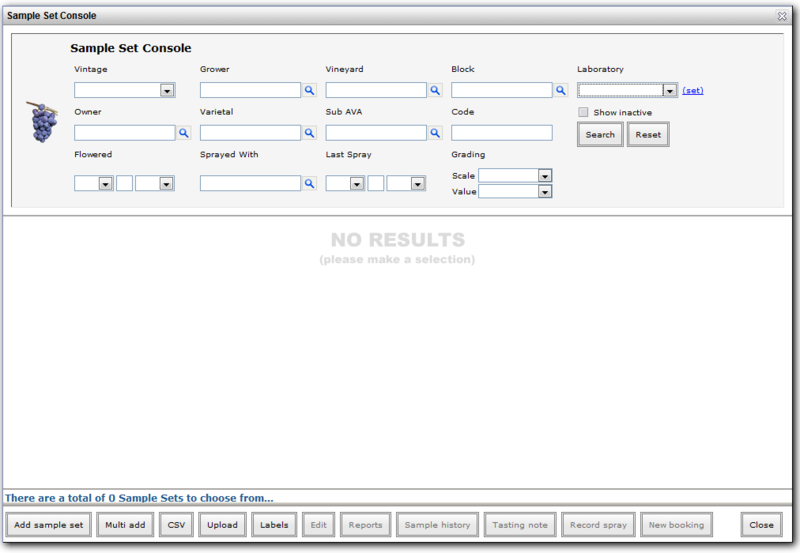 From the Sample Set Console locate your desired sample set and select the Sample history option. You will be provided with a list of past samples. Click the View option to see more detail. You can see all the values selected by the user when the sample was recorded. To reverse the analyses click the Reverse/Undo button. To edit the measurements, click the Edit option. To record a tasting note, open the Sample Set Console and locate the sample set. Click the Tasting note button. Enter your tasting notes in the text box before clicking Now+Save. See the next section on weighbridge bookings for more information.